This is a kind of fitting post today because as this posts we should be on a bike ride, though not motorized, on an old railroad route in South Dakota. On Sunday we visited Sturgis where they hold the huge motorcycle rally every year, this year is the 75th Anniversary. 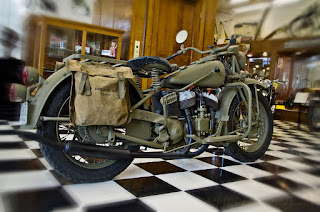 They have a great motorcycle museum there and this is one of them featured. This is an Indian Military bike which I had never seen before, these are usually Harleys. This one was a 1943 Military Scout 741 bike that was restored in the 1990s. If I could have any antique motorcycle, I would have an Indian. They are very beautiful bikes.